Binge Watching..Your TV will never go for it. YOUR TV IS TELLING YOU WHAT TO DO.......Don't believe me? So I've seen all this talk about how TV series have just dropped all their shows at one time instead of in weekly increments. At first I thought this was wonderful! I can watch anytime I want and not have to wait for a 'to be continued' to come along. Pretty great, right? YEAH!!! Not really. What happens when we watch it all? Then what? What will we talk about? I take for example, LOST. I was/am an avid fan of the LOST TV show. Even though I DVR'd it, I still watched it live. Had to. Had to see what happened next. PLUS, I didn't want it to be spoiled for me(thanks internet). What it also did was allowed us to talk about the latest episode the next day. Talk theories, story lines, etc... There was anticipation. I was excited for next week's episode. But that goes for any TV show. Take Community or 30 Rock or The Office or shows like that. You all laugh about what you just watched the night before. Quoted lines. Favorite parts. It was fun. It was easy. But what if it's all right there in front of you. When do you talk about it? When is it time to quote a line? Certainly you don't want to spoil it for the person who only watched 3 episodes instead of 12. Plus who has time to binge watch? Sure I know some people do, but I don't. I have a job. I have a family. I have a band or 3. Plus, how do you talk about 6-12 hours worth of TV in a lunch hour...or a 2 hour drinking session..or a 15 minute break.... You can't. People can't stay retain that much information, let alone find 2 or 3 other people who can. There's Facebook and Twitter and just about any other distraction that will take the place in your brain of whatever you just watched on TV. It'll kick it right out. Then you have to re-watch...and maybe that's the point. I don't know. And that brings me to my next point, re-runs. Re-runs are a staple in any TV series. Hurray, we get to watch it again. The TV is telling me to watch it again. People can't make those decisions on their own. Syndication is another great thing. Whoopie! I get to watch the WHOLE series on another channel...on TV....when they tell me to. Yes, your TV is telling you what to watch. AND that's the real secret. YOU'RE TV IS TELLING YOU WHAT TO DO! If you were given a choice to watch ANY 15 NEW TV shows out of 100 for the fall season just based on title or actors, you'd be LOST....and I don't mean stuck on an island, lost..I mean you wouldn't watch TV at all. Make a decision? Hell no. So what does TV do for you? It makes the choices for you. It tells you which 15 you get to choose from. It tells you when(for the most part) you have to see them. It also encourages you to watch them live(social media and internet spoilers again). I'm not saying binge watching won't take off. I'm just saying, I like the process. As much as I hate the anticipation, I love it. I need it. It's what keeps me coming back for more. I found this guy on my porch. 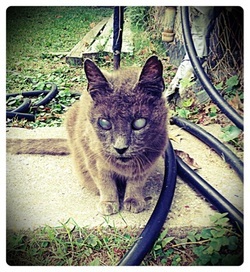 I dub thee Zombie Cat. (actually its as blind as a bat). Gets around pretty good though. He'd be the only cat I would consider associating myself with.